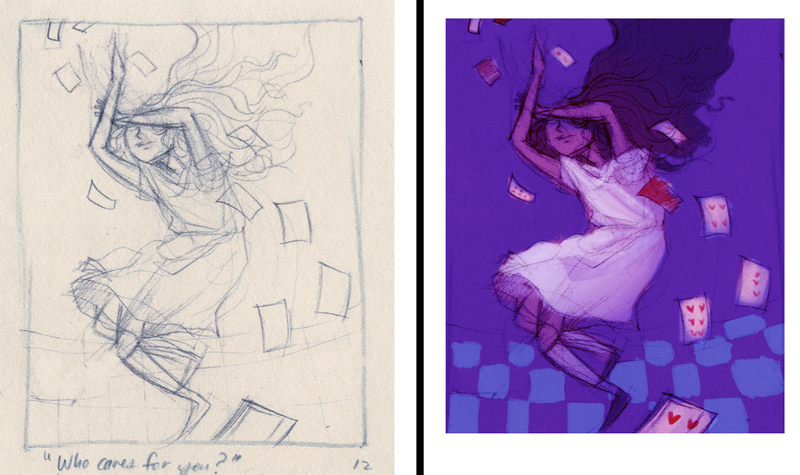 Note : I am posting the progression of these Alice pieces, start to finish. This stage is the underdrawing. Next post,Wednesday : "What is his sorrow? I'm thrilled with the Hatter's face. I can't wait to get to drawing it. I've always had a thing for drawing jackets and ties and turned up collars. In real time news, I am caught up with these posts -- I'll be starting the final drawing for this one tonight! Next post, Friday : "Nonsense!" I could probably say this with most of these but I'm really looking forward to getting to this one. I'm pleased with this one for a number of reasons but most of all I'm happy with Alice's hair. I'm looking forward to drawing it and the actual thistle. Drawing a puppy is a means to have a real reason to draw a thistle. In real time news (since you must know that I don't post these instantly as I finish them) I'm just about right behind the roughs in terms of finished drawings. I've got the first three completed and I'm very happy with them. They will be the next stage of postings after these roughs. I was really happy to get to this one, I've been looking forward to doing more figures in a scene. The Dodo was pretty fun to get started. I can't wait to finish it. 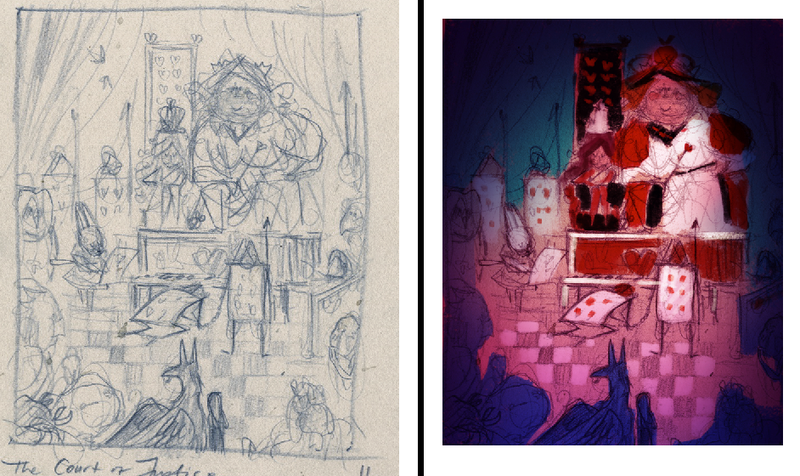 In real time news, I've just completed the underdrawings for all 14 pieces, though I am spacing out the posts here. I hope to begin the final drawings this weekend. Next post, Monday : "The Thimble." I'm pretty happy with this one, I'm looking forward to drawing the figure. There's still a lot to figure out with the final drawing and painting for it. Next post, Friday : "I wish I hadn't cried so much!" Here's a look at the underdrawing for the first piece. 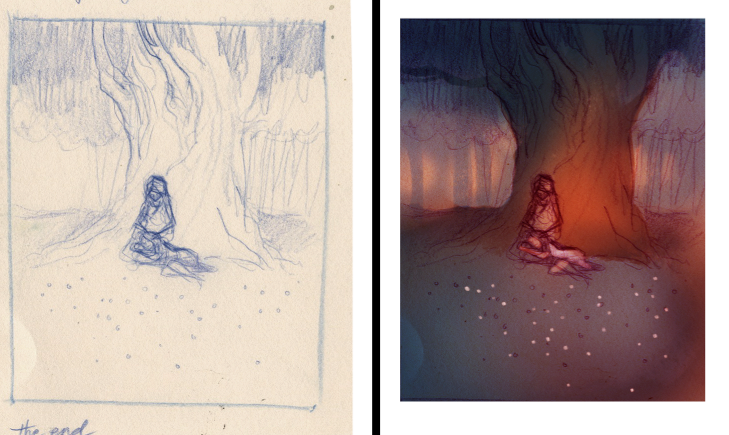 I typically rough my work out in a blue col-erase to find my lines and move on to the finished drawing from there. There's not a lot to see here, I'll figure most of my work in with the final pencil. 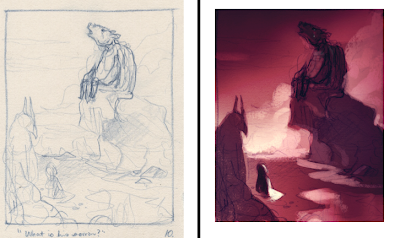 I usually leave most environmental stuff for that stage (though I block in my shapes with the blue) but I'm careful to render out any figures with the blue and establish the proportions I want in this stage. Previously, 1/14 rough + color study. My little sister is one of my most favorite people ever. She's really the best little sister anyone could have ever asked for. She's a brilliant artist, she's clever and very funny, and she's sweet. She grew up watching me play Zelda. She is one of the most fun people to watch movies with because she invests on every level into the story. Unfortunately, she's spent her entire life living in my shadow. This minor annoyance comes up every now and again. 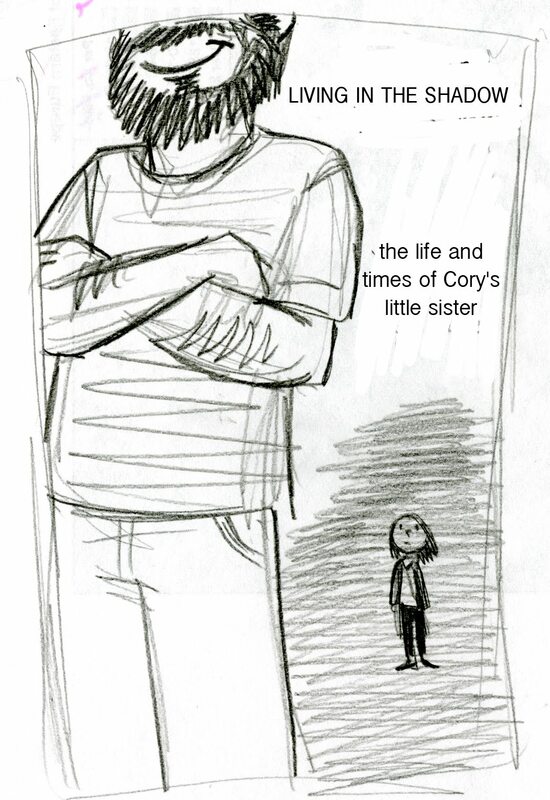 She recently scrawled a quick little comic about it and sent it to me. Enjoy. Here's the complete collection of all the color studies. I'm pretty pleased overall with how they look together. This helps me to get all my ideas in order and see how they flow. Tomorrow! A special, weekend edition guest post; a comic drawn by someone who has always lived in my shadow!
" ...and found herself lying on the bank, with her head in the lap of her sister, who was gently brushing away some dead leaves that had fluttered down from the trees upon her face. 'Oh, I've had such a curious dream!' said Alice, and she told her sister, as well as she could remember them, all these strange Adventures of hers that you have just been reading about; and when she had finished, her sister kissed her, and said, 'It was a curious dream, dear, certainly: but now run in to your tea; it's getting late.' So Alice got up and ran off, thinking while she ran, as well she might, what a wonderful dream it had been." And so we're nearly at the end of this first stage of posts. Thanks for sticking with me through it! 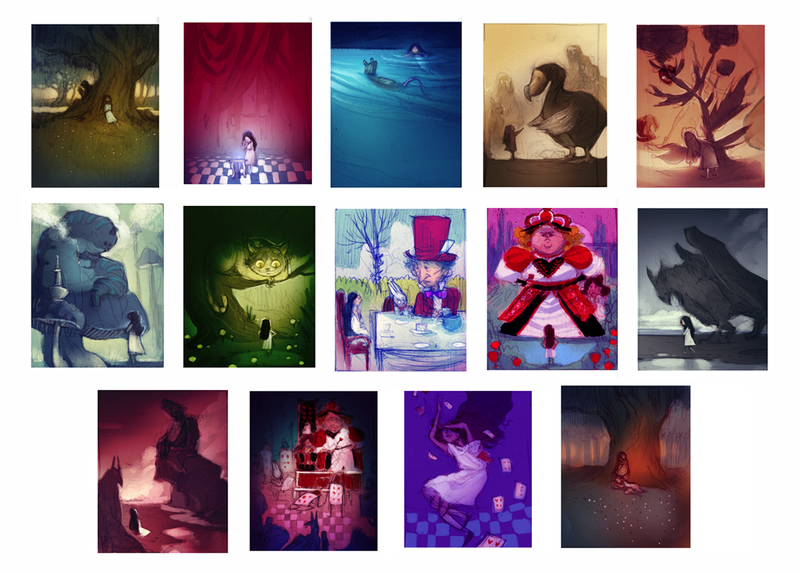 Tomorrow I'm going to recap, all of the color studies together and see how they all look next to each other. From there, next Monday (5/6/10) begins the real posts -- the final drawings. At this the whole pack rose up into the air, and came flying down upon her..."
"The King and Queen of Hearts were seated on their throne when they arrived, with a great crowd assembled about them--all sorts of little birds and beasts, as well as the whole pack of cards: the Knave was standing before them, in chains, with a soldier on each side to guard him; and near the King was the White Rabbit, with a trumpet in one hand, and a scroll of parchment in the other. In the very middle of the court was a table, with a large dish of tarts upon it: they looked so good, that it made Alice quite hungry to look at them-- 'I wish they'd get the trial done,' she thought, 'and hand round the refreshments!' But there seemed to be no chance of this, so she began looking at everything about her, to pass away the time. The judge, by the way, was the King; and as he wore his crown over the wig, he did not look at all comfortable, and it was certainly not becoming." Next post, Wednesday : "Who cares for you?" "They had not gone far before they saw the Mock Turtle in the distance, sitting sad and lonely on a little ledge of rock, and, as they came nearer, Alice could hear him sighing as if his heart would break. She pitied him deeply. 'What is his sorrow?' she asked the Gryphon."